Summary: Mustafa and his family have recently moved from a country that was full of smoke and fire and loud noises. His new home is near a park, and he goes there every day. He sees many people and surprising sights like leaves turning color, kids in Halloween costumes, and a girl walking her cat on a leash. Sometimes he draws pictures of his old home with a stick in the dirt. He often feels invisible, with all the people rushing past him, but one day the girl with the cat invites him to come with her. She shows him a goldfish pond, and they feed the fish together, then go for a swing. When she tells him her name and learns his, Mustafa starts to feel like he is no longer invisible. 40 pages; ages 4-8. 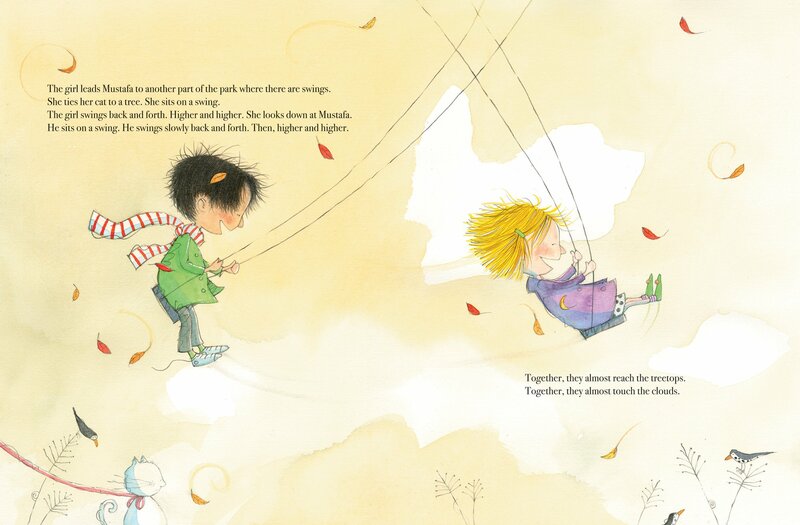 Pros: A beautiful, sweet story about the immigrant experience through the eyes of a young child trying to process all the difficult things that have happened to him. This would be another good back-to-school book, especially if there are new kids in the class who may be looking for a new friend. 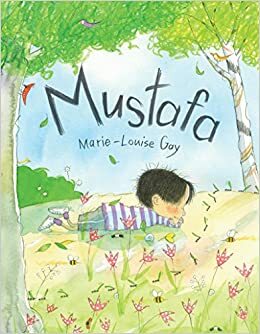 Cons: Don’t skip over the title page and the one after that–it shows Mustafa and his family traveling to their new home.